Edmonton, Alberta (Canada): Mixed martial arts is all about overcoming obstacles. Whether it’s training, weight-cutting, and defeats, or scheduling conflicts, equipment issues, and venue changes, adversity is very much part of the life of anyone involved in MMA. Aggression MMA is not exempt from this. At its last event, some cage issues caused some problems at the event. However, the house was near-capacity, and the crowd was hot. Several great performances were given, including a bout many called “Fight of the Night” between Steve Beaumont and James Haddad. Jason Gorny and Elmer Waterhen engaged in an eye-pleasing slugfest, and former Edmonton Eskimo Rio Wells got the submission victory after suffering his first career loss recently. In short, the fights just kept getting better and better. Jim Miller to Melvin Guillard: Bring it On! Melvin Guillard is fresh off another first round knockout, this time against Shane Roller at UFC 132. In a post fight interview with Karyn Bryant of MMAHeat, the Young Assassin called out Jim Miller, who has a fight coming up against Ben Henderson on August 14th at UFC Live. Jim Miller, definitely, that's the fight I want. That's a fight I need to get. I need him to stay undefeated, though, for me to fight him. I am honored that Jim is so highly viewed amongst his peers as a top level fight. My advice to Melvin is stay in shape and if Ben Henderson gets hurt, lobby to be the replacement. I will accept that fight now as a replacement should something happen so that we are one step closer to granting Melvin his wish of scrapping with Jim. In other words: Bring it on! Stylistically a Guillard vs. Miller fight would be a shoo-in for FOTN. I think Melvin, who loves to get the KO, is underestimating Miller's chin, however. Jim has never been knocked out or even rocked and his submission game is top notch. Subs have been a problem for Melvin, and a fight against Miller would probably not go the way he wants it to. Melvin, of course, is referring to Bendo when he talks about Jim staying undefeated. Jim is training hard for that fight and therefore had no comment on Melvin's statement. He is totally focused on August 14th. I’m really surprised Tito took this fight. It seems like Tito never takes a fight that he doesn’t think he’s absolutely going to win. I see Bader taking Tito down and just being too much for him. If they were just hitting pads I would say Tito might look prettier, but this is a fight and Tito doesn’t like to get hit. I’ll say 65%/35% for Bader. The UFC was pretty interesting. Tito did win against a tough opponent, so I guess he’s still alive in the UFC. Although it has been a little while – his last two wins in the octagon were in ‘06 against Ken Shamrock. Tito is one of those guys that feels he needs to be in the public eye to feel good about himself; so maybe this win will boost his self-confidence. It's pretty obvious that Hughes is no fan of Tito's. And althought they've never fought, they did complete in a grappling match at ADCC, which you can check out after the jump. The State Assembly remains conflicted when it comes to legalizing the sport of mixed martial arts, but that hasn’t stopped a growing list of local fighters from entering the octagon in surrounding states and generating excitement. 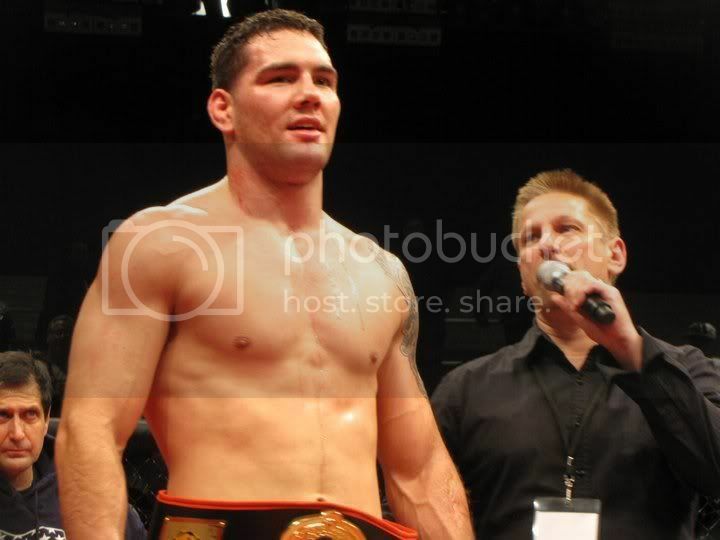 Baldwin’s Chris Weidman, a state high school wrestling champion at 189 pounds in 2002, has become one of the fastest-rising stars of the Ultimate Fighting Championship series after winning his first two bouts, the latest a first-round submission of Jesse Bongfeldt on June 11. The transition from wrestler to practitioner of Brazilian jujitsu has been swift for Weidman, who earned his state wrestling title in front of several thousand fans. His victory over Bongfeldt was seen by more than 1.6 million people on Spike TV and an additional 14,635 live at the UFC 131: Dos Santos vs. Carwin in Vancouver, B.C. Weidman’s rapid development (he’s 6-0 professionally with a Ring of Combat middleweight championship) has prevented him from sneaking up on anyone, but that may be a good thing in the UFC, where popularity on Twitter (Weidman’s Twitter tag is @ChrisWeidmanUFC) can lead to monthly financial bonuses. In some respects, it’s the mental makeup of the 6-foot-2, 186-pound middleweight that has already helped him push his way into the spotlight. His UFC debut against Alessio Sakara, on March 3, came with just three weeks’ notice, as Weidman was trying to heal a fractured rib. He jumped at the chance to fight and won a unanimous three-round decision over a veteran opponent with 22 MMA fights and 11 UFC bouts to his credit. 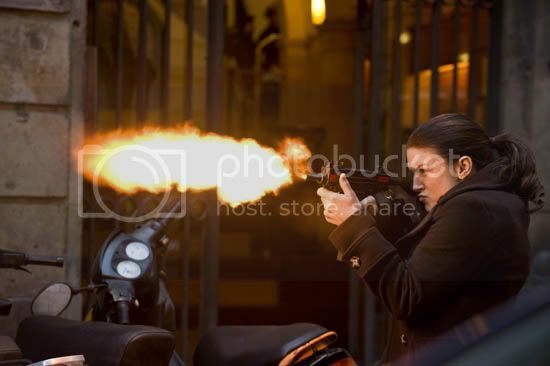 Gina Carano not only has bombs in her fists, she has guns in her hands. Like many MMA stars, Gina has crossed over into movies and her latest role is in the upcoming action thriller Haywire. Gina looks very comfortable while shooting her weapons. Interestingly, Cristiane Cyborg Santos was nowhere near the set during firing times. More pics after the jump. Pride is dead but not forgotten. The venerable Japanese promotion committed "sepaku" shortly after its purchase by Zuffa, to the dismay of many fight fans, but there's good news on the horizon. The UFC is planning on returning to Japan later this year, according to UFC president Dana White. We're going to come to Japan, and probably very soon. Nate "The Great" Marquardt was scratched from his main event fight in the UFC after failing his medicals last week, and was subsequently fired from the organization. Due to Pennsylvania privacy laws, the commission could not reveal the nature of Nate's medical condition, but that didn't stop Dana White from firing Marquardt on the spot. Today, Nate was a guest on the MMA News Hour and revealed the reason that he failed the test. It turns out that Nate is on TRT, a testosterone replacement therapy. This in and of itself is not a reason to disallow a fighter to fight, because Low-T is a valid medical condition. However, when under a doctor's care for Low-T, a fighter must still maintain testosterone levels that are within the guidelines. This is where things went bad for Nate, as his levels were too high. Apparently he and his doctor misjudged the dosage resulting in Nate coming in over the limit--a situation that was entirely preventable. That's why Dana was so pissed. Because now Nate (and the UFC) will now have to endure more steroid accusations. Nate is pretty bummed out about the whole thing and actually broke down in tears today. People are already speculating on how a physical specimen like him could have Low-T, which is to be expected of course. It remains to be seen if winning fights in smaller orgs will help Nate once again fight in the big show, as Dana seemed pretty adamant that he was gone for good. Here's hoping Nate Marquardt can somehow get his MMA career back on track. Charlie Brenneman was supposed to be fighting TJ Grant at the UFC on Versus show last night, but Grant got sick and had to pull out of the fight, leaving Brenneman with no opponent. At first this seemed like bad luck, but it turned into a blessing for "The Spaniard" when Nate Marquardt failed his medicals. Brenneman stepped him for Nate against Rick "The Horror" Story and put on a great performance, out-wrestling Story and winning a unanimous decision. Brenneman, who is trained by Mike Constantino out of the AMA Fight Club in New Jersey, is now sitting pretty atop the welterweight division. His impressive performance will lead to another fight against a contender, and it's possible that Brenneman will be considered for a title shot in the future. After Nate Marquardt failed his medicals and got booted from both the card and the UFC on Saturday, Cheick Kongo and Pat Barry found themselves in the main event of the evening, and they took the opportunity to put on one of the most amazing fights in UFC history. Barry had Kongo on queer street, and it looked as though referee Dan Miragliotta was going to stop the bout. But Big Dan determined that Kongo was not quite out and was still fighting back. On the commentary, Joe Rogan was already starting to question Dan's decision to let the fight continue, but then Kongo landed two right hands that put Barry out cold, thus producing what is being called the greatest comeback in UFC history. Great reffing by Big Dan Miragliotta! And great composure by Cheick Kongo, who took everything Pat Barry had and still came back to turn the tables. Check out a GIF of the "Comeback" after the jump. The Dolce Diet: Finally a Diet that works!